We’ve known since the middle of September that North wouldn’t be able to go trick-or-treating this year because they’ll be on a two-and-a-half-day outdoor education field trip over Halloween. (All the sixth graders in Montgomery County go on this trip but not all at the same time. North’s school was split into three shifts and they drew the short straw.) A friend of mine commented it was bad luck indeed, as Halloween is “the holiest day” in our family calendar. We carried on as best we could, though. Beth and North went camping two weeks ago and the campground had some Halloween-themed activities—trick-or-treating from tent to tent, and a costume contest. North wore a yellow t-shirt with the word “Life” written on it in black marker and carried a bag of lemons. Get it? They won the contest, but said they felt kind of bad about it because the competition was mostly little kids. But we do take costume contests seriously here. 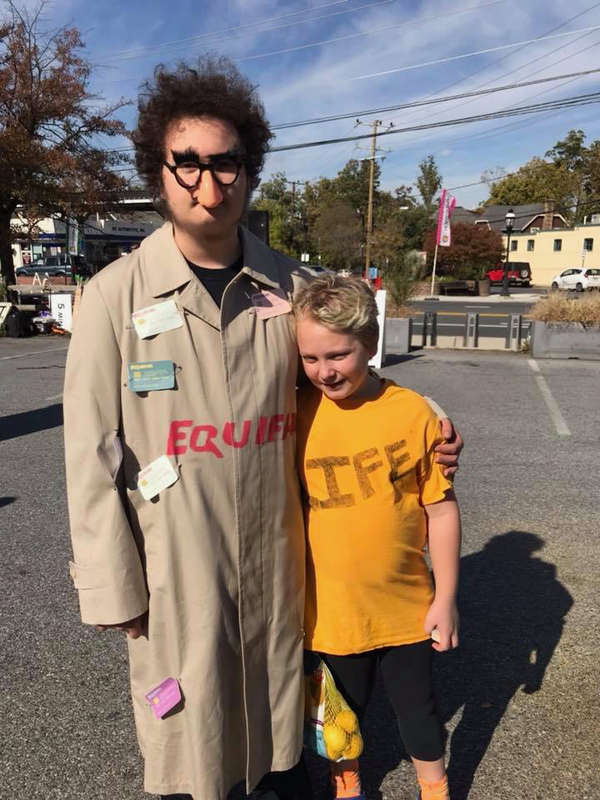 Both kids have won the Takoma Park Halloween parade costume contest (Noah several times) and Noah won a costume photo contest at his school in ninth grade. We continue to expand our costume contest empire, little by little. 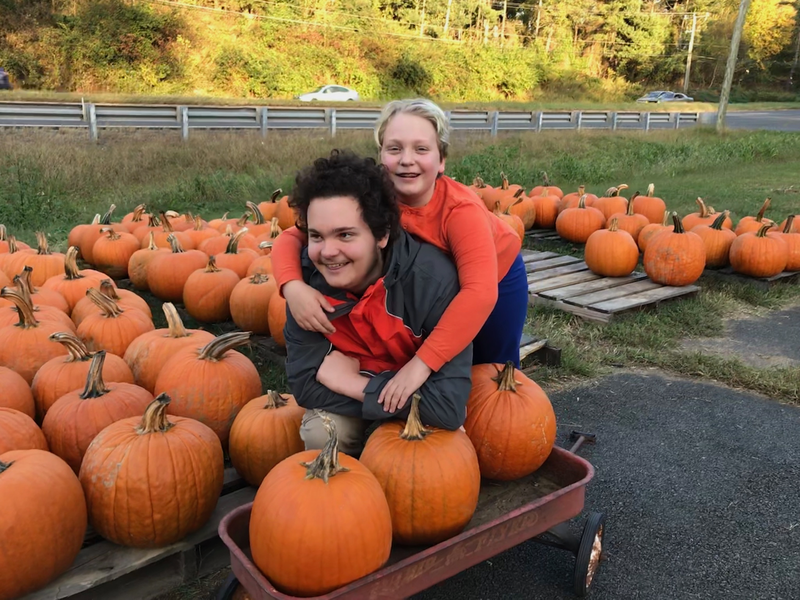 We also went to our favorite pumpkin patch in Northern Virginia a week ago. This was a fun expedition, even though traffic was awful both ways. At one point, I told Beth we were on “the highway to hell,” because we were listening to a Halloween playlist Noah found and that song was on it. But we finally arrived after about an hour and fifteen minutes (a half hour longer than it usually takes). We got pumpkins, decorative gourds, and cider and then went out to dinner at Sunflower, where we ordered a veritable feast of vegetarian Chinese food (and ate almost all of it). Toward the end of the drive home, the playlist ended and we had our D.J. take requests. North wanted to hear “Purple People Eater” and “Monster Mash,” opining it was “a disgrace” any Halloween playlist should lack those songs. I picked “Season of the Witch,” and Beth chose “Werewolves of London,” which caused a lot of howling in the car. And slowly, over the course of a few weeks, we decorated our yard with our ever-growing collection of ghosts, skeletons, zombies, etc. 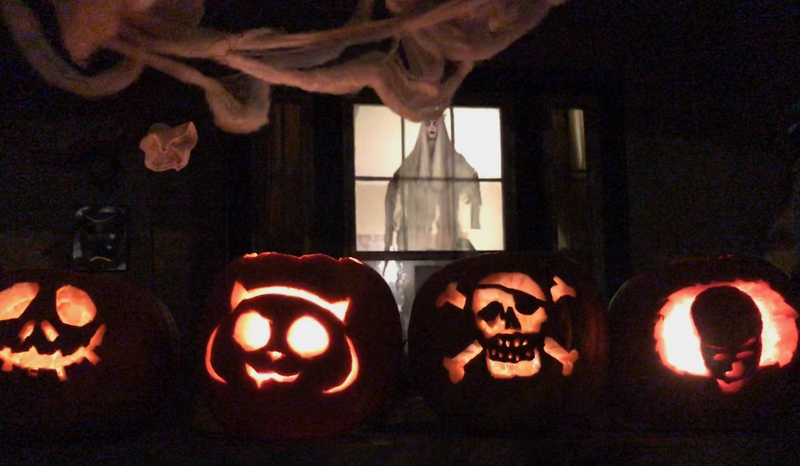 This year’s additions include a portrait that screams when you press a button (we hung it on a nail next to the front door), more spider webbing, a metal cut-out of a witch, a large window decal of a ghost, and pumpkin-head torso that emerges from the ground. The Takoma Park Halloween parade was Saturday. North had considered expanding their Life costume to be the game board of the game of Life, still holding the bag of lemons, but they decided that might just be too confusing. 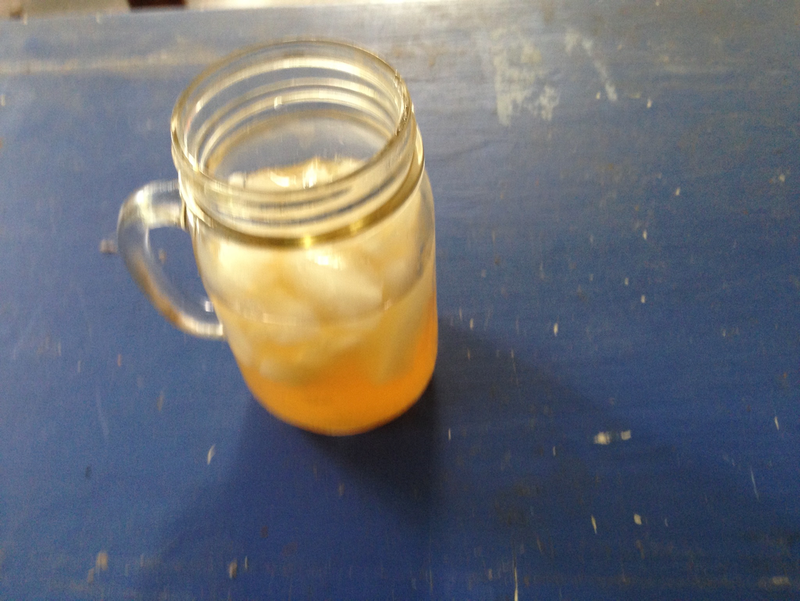 So, they printed up business cards with a recipe for lemonade to hand out along the route and they were done. Noah decided to go as the Equifax data breach. He wore a thrift store trench coat with the Equifax logo painted on it and credit cards pinned all over it and glasses with bushy eyebrows and a false nose. There was originally a mustache under the nose but it was oddly narrow and both my and Noah’s first thought when he tried it on was “Hitler,” so he cut it off. I also warned him not to wear shorts under the coat, even though the day was warm, because “flasher” wasn’t the look he was going for either. As often happens, Noah was engaged in costume-making right up until the deadline. North and I helped him pin the credit cards—they were all printed with his name and the number 1031 2017 0000 0000—to the trench coat. We decided to walk to the beginning of the parade route because no one’s costume was bulky this year and it’s always hard to find parking. 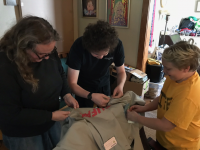 (It was also the first year in recent memory no one’s costume required large quantities of cardboard—so of course this was the year Beth had been saving it). The festivities begin in the Co-Op parking lot. There were games for little kids, a spider web background for picture taking and a can-you-guess-how-many pieces jar of candy corn. North and I both submitted guesses. Mostly though, people walk around and look at each other’s costumes. I was surprised at the dearth of political costumes. These are always popular and last year there were even more than usual. Maybe everyone needs a break from politics these days. The closest thing we saw was probably the group of famous artists (Leonardo Da Vinci, Vincent Van Gogh, Georgia O’ Keefe, Andy Warhol, and Bob Ross) carrying a banner that protested funding cuts to the NEA. There was a strangely large number of teenage girls dressed as cats and about the usual number of zombies. We saw two adults dressed as bacon and eggs and a girl dressed as a deviled egg (egg with a trident, cape, and horns). Probably the best costume we saw belonged to a girl who’s a year older than North and used to wait at their elementary school bus stop. She always has memorable costumes. This year she was a bowl of fruit loops. She stood inside a giant papier mâché bowl filled with sliced up pool noodles of many colors. There was a milk jug suspended over her head with white cloth “milk” tumbling down into the bowl. Along the way North saw a lot of kids they know, one from drama camp dressed as an archer and another as Wonder Woman, two basketball teammates dressed as milk and cookies, a former classmate in an Octopus’s Garden group costume with her family. There was a band playing and I thought I probably had time to get an iced latte at Takoma Beverage Company before the costume contest results were announced. It was a close thing, as it turned out. I missed all the four and under and some of the five-to-eight winners. A vampire cheerleader and a monster from Where the Wild Things Are won in that age group. The nine-to-twelve group was next. Scariest went to the girl with the half-unzipped face. (Google zipper face if you want to see it—there are a lot of make-up tutorials—but be warned, it’s pretty gory, so I’m not including any links.) Funniest went to the bowl of fruit loops, and cutest went to a Starbucks latte. North was disappointed not to win, but all the costumes that did win were very well executed, so it was hard to complain. “The judging was fair,” they said. In its publicity, the rec department advertised the categories would be Scary, Funny, and Cute this year, which was a change. There used to be an Original category instead of Cute. I thought this worked against my kids, especially Noah, who when he wins, tends to win in Original. Before the parade I thought North had a shot in Funny and Cute and Noah in Funny and Scary—after all the Equifax disaster was pretty scary. As it turned out, though, categories were inconsistent across age groups, with some groups still using Original and others not. Teens and Adults were up next. Scary went to a woman in a black Victorian dress with a bustle and a black, metallic-looking unicorn head. The effect was kind of steampunk and very cool. Most Original went to the chicken from Moana. We all instantly protested to each other that characters in Disney movies are not original, even though it was a very nicely done costume. Funny went to Seven Snow Whites (some of them cross dressing) and one Dwarf. More family protests—they should have been in the group category! So, Noah didn’t win either. It was the first time since 2012 that neither of the kids has won. We stayed to see the group costumes judged. A Ghost Busters group won first prize (“First prize?” we all exclaimed. What happened to the categories?) But the protesting artists won second prize and I was glad to see them win. We made our way home and before we had a dinner of pasta with pumpkin sauce and carved our pumpkins into a cat, Jack Skellington from Nightmare Before Christmas, a skull-and-crossbones, and a scary clown, North made lemonade out their lemons. 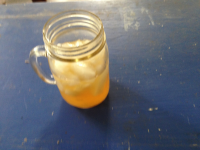 Because when life gives you lemons, there’s just one thing to do.